What is a Savannah Cat? What is a PCR Test? Why are Savannah Cats expensive? 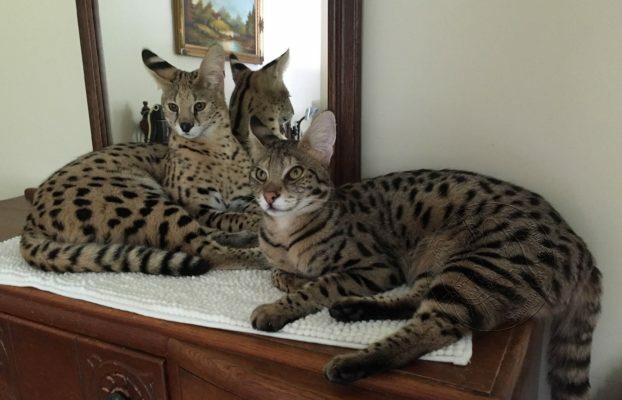 As breeders, we often hear the question, “How big will that Savannah cat get?” It is frustrating at times. As breeders, we have these beautiful kittens with huge ears, long legs, and black markings and many people just ask about Savannah cat size. Savannah cats are usually taller than most other breeds of cats. They have long bodies and graceful long necks. Because if that, many people think they weigh much more than they do. Once, as an experiment, a tall F3 Savannah male appeared at a TICA show. Spectators held the F3 and guessed his weight. Most people guessed between 18 to 22 pounds. The F3 Savannah weighed 14 pounds. So, you see, if a person is holding a big, long-legged cat, the tendency is to overjudge its weight. The early generations, F1 and F2 are, more times than not, the biggest Savannahs. That doesn’t mean, however, that you won’t find a large F5 or other generation. This article studies the actual size of Savannah cats of all generations. It has actual Savannah gender, height and weight. We intend to add data as time passes and also keep a history so Savannah cat size may be tracked to see if generations are getting larger or smaller as time goes on. H will always mean height. W will always mean weight. If you have a Savannah cat and you would like to be part of our project to determine how big Savannah cats get, please send height, weight, gender and generation of your cats. Your name and cattery name (if you are a breeder) should also be included. Email us. *These cats are young adults. Your donations are tax deductible. If we've helped to get you a great Savannah cat or kitten, please consider donating.